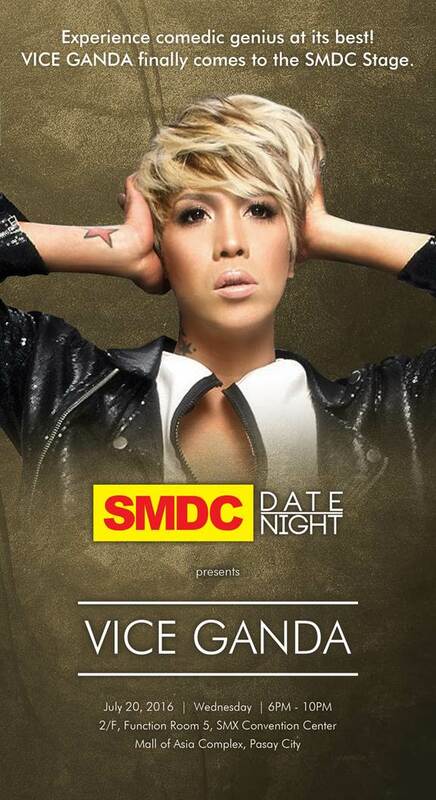 Anyone wants a ticket in his gig this coming Wednesday (possibly talk about the new property investments available with SMDC) you can RSVP and I can save a seat for you. After my 1st week here in California, the project that has generated the most interest is our studio units in Asten. The project is located along Yakal St. and it has a big potential based on different factors. 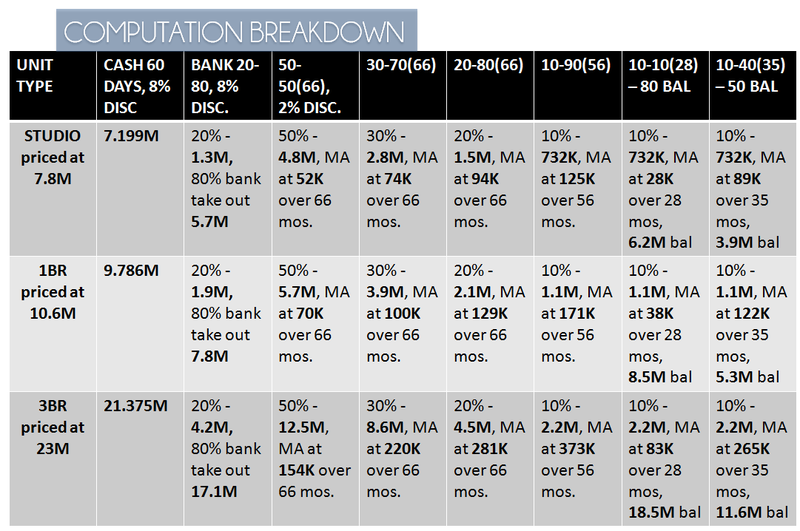 ROI is above 10% on an 8 year time frame. The comparison for this, is a project within the 250 meter radius, Belton Place. Belton Place is 5 lots away from the project. It started pre-selling at P 1.6 M pesos for a studio unit size of 21 sqm last 2009. 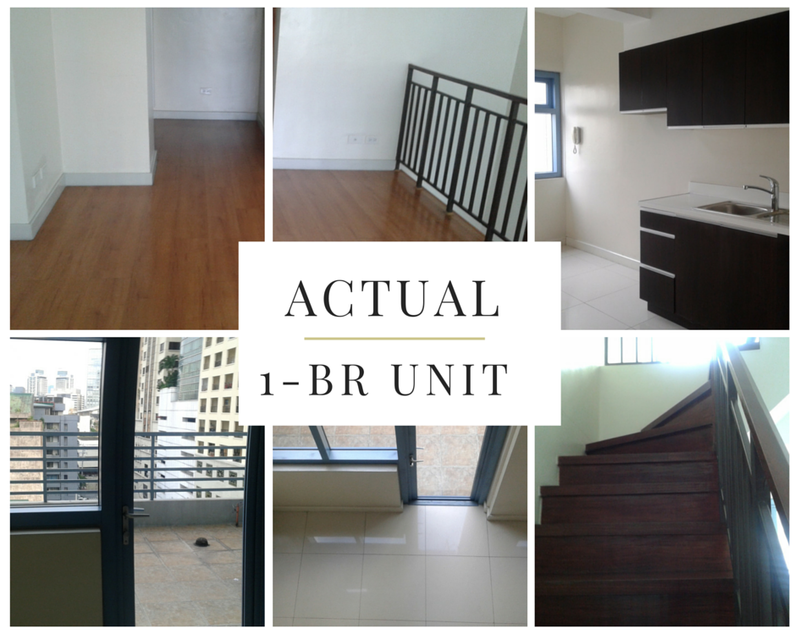 It was ready by the First quarter of 2012, and rentals started at P 14 K / month for unfurnished units and P 15500/ month for furnished studio units. It has a yearly escalation of 8 to 10% every year, that current rental rates today is P 18 K / month for unfurnished and P 20K a month for furnished units. Last 2009, studio units are priced at P 1.6 M. For the same project and size, you can get a studio unit at P 2.6 M pesos. An average appreciation of above 10% a year. The area is being redeveloped as the ” Noma ” District or North of Makati District. There will be a Shangrila and an SM Mall in the area as well as the West End Tower, a 20 storey BPO office. There are 3 more new offices being built in the area that would only contribute to more rental incomes targeting the future employees for these offices. There are new and desirable places to live in, such as BGC, Nuvali and the future districts of Ayala in the suburbs. But, Makati is still the most feasible location for investors and future landlords looking for a higher rental income because this is the center of finance in the Philippines. For the past few months, professionals working in Makati has considered getting a property in this area because of the traffic situation. This has increased demand for more investments not only with our foreign investors but our local professionals who are able to purchase a unit because of their higher salary compared with professionals working from other areas in Manila. 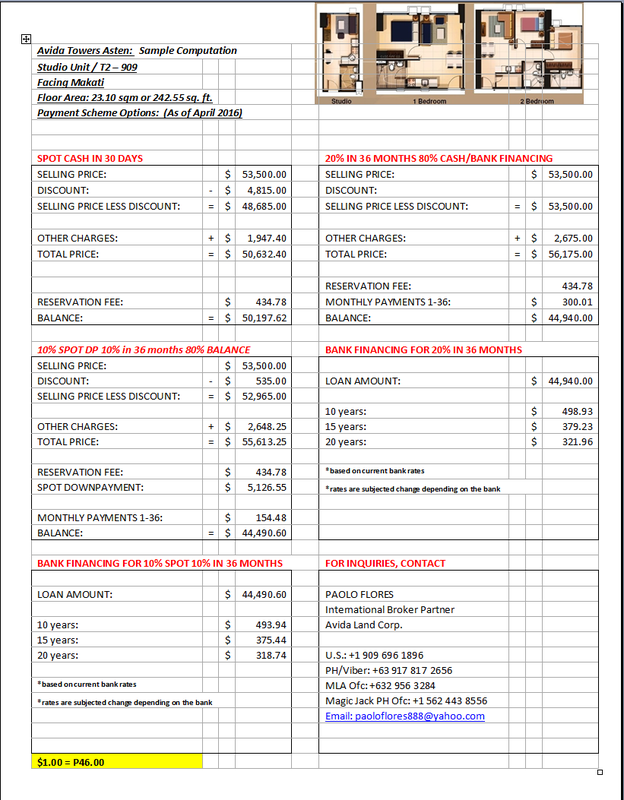 Not to mention, the flexible payment terms offered today. 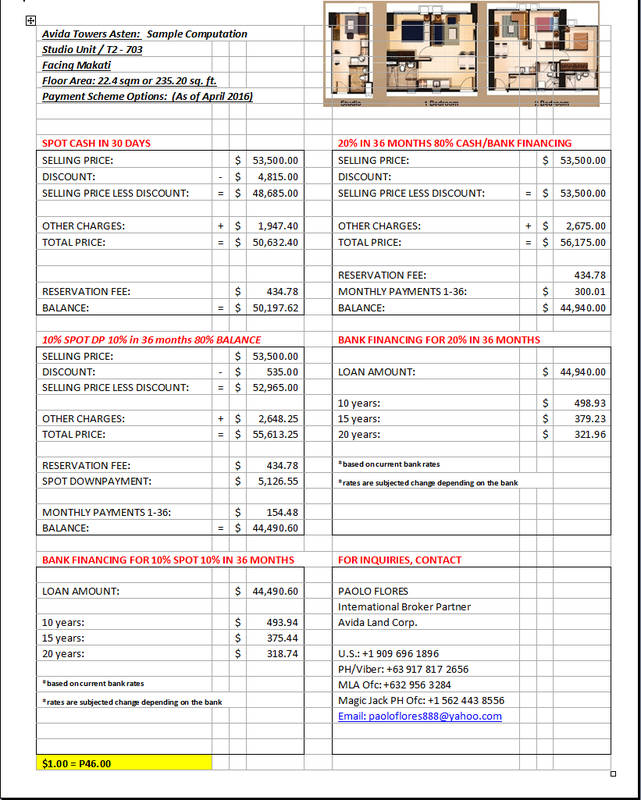 As a unit owner and a leasing broker in Belton Place, I share with you the advantages of getting a property in Asten. 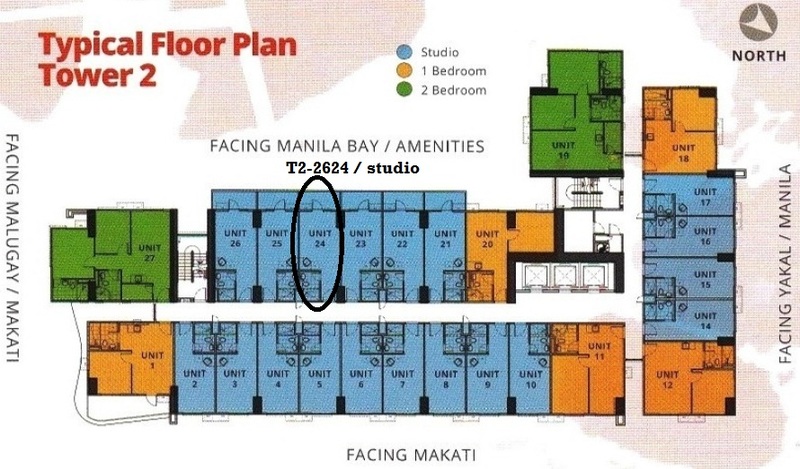 The studio units are sized bigger at 25 sqm. 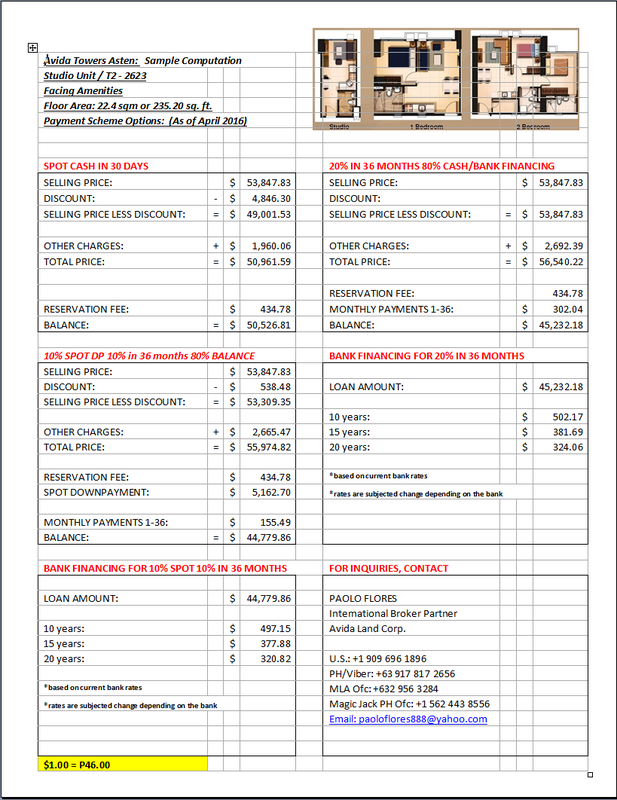 and an average price of $ 55 K dollars for the unit with monthly payments of $ 303 / month, and it becomes $ 320 a month once it is financed through our partner banks. By the time it is ready for occupancy, given the current rental rates of $ 400/ month in Belton Place, there is a big potential for your unit to be self sustaining in terms on your return on investment. 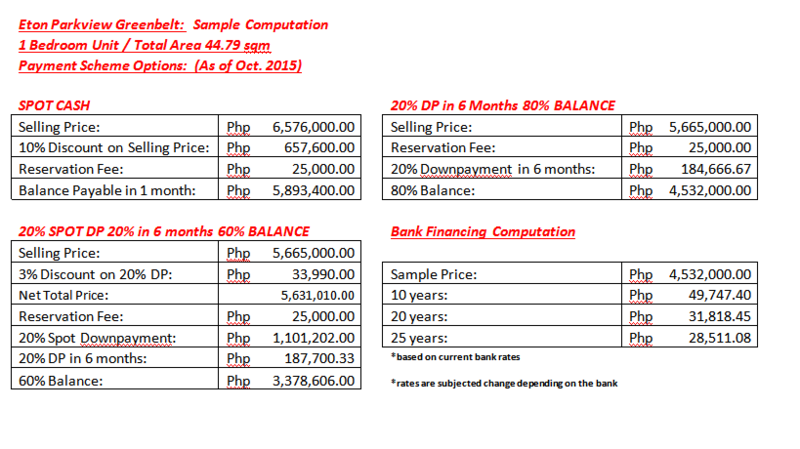 As of the 1st week of April, these are my suggested units for the purpose of rental income. We also have 1 bedroom and 2 bedroom units available. But with this project, the studio units will be more formidable for our balikbayans looking for an alternative investment. To live in the city, for some, is the best decision because of its close proximity to leading business and commercial hubs. Just imagine the number of malls, hotels, and buildings within reach. 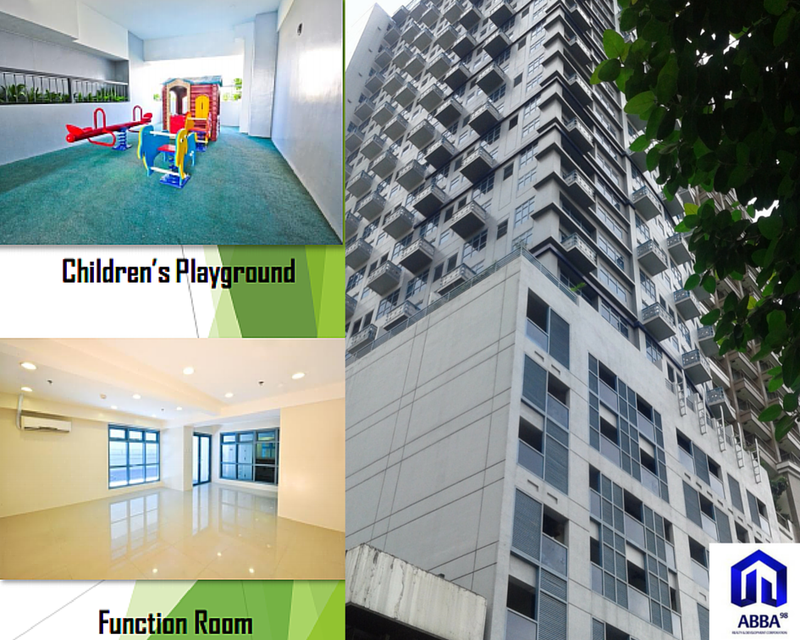 Light Residences is situated on a 1.9 hectare prime lot at the corner of EDSA and Madison St. in Mandaluyong. It is composed of 3 residential towers with a common podium with commercial spaces and parking levels. It offers studio, 1-bedroom, and 2 -bedroom units, 4227 in total. AMENITIES: include a Grand Lobby, 20,000 sqm retail area with cafes, restaurants, and shops at the ground and second level. Cinemas at the 2nd level, and dedicated parking for retail guests. There are also 4 high-speed elevators per tower. Landscaped amenity at the recreational deck (8th floor) which has an area of about 8,000 sqm houses the gym, function rooms, and swimming pools. 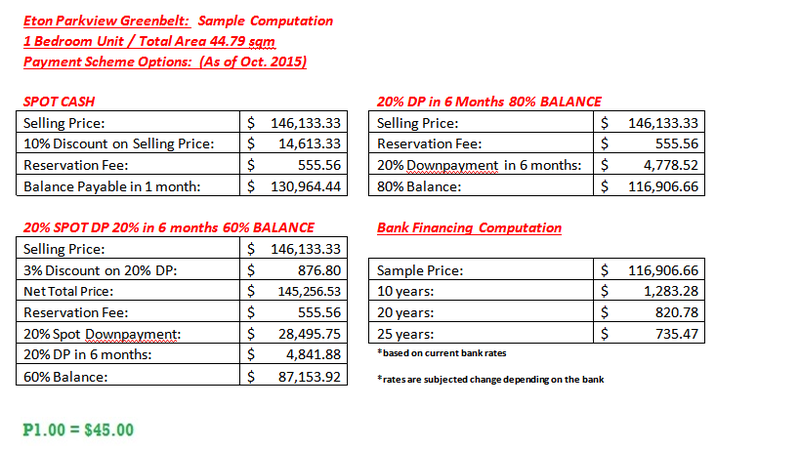 PRICE: See sample computations here. 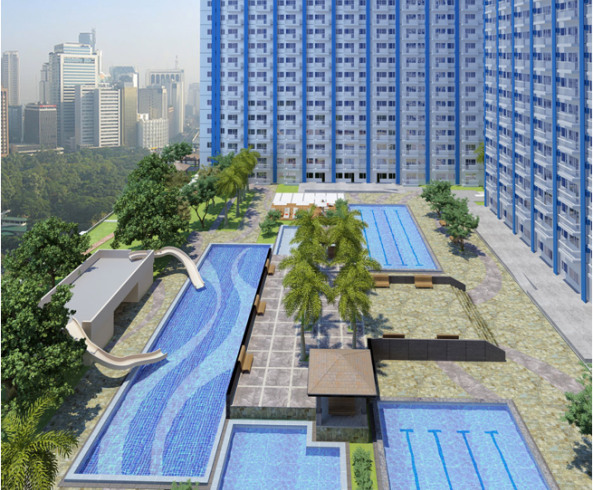 Jazz Residences is situated on a 2.5 hectare property in Makati City. It is composed of 4 residential towers with sprawling amenity podium, 1 basement and 3 podium parking levels, and 2 commercial levels. 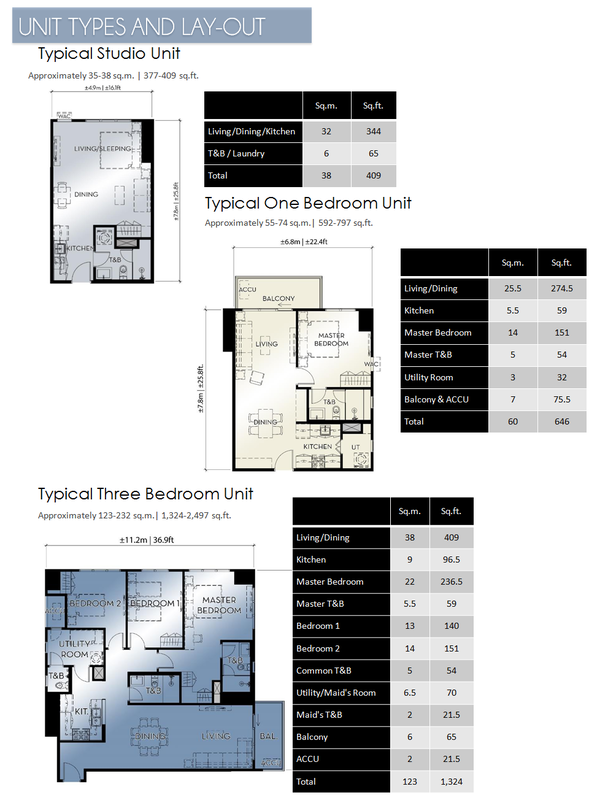 Each tower is comprised of studio, 1 bedroom and 2 bedroom types. 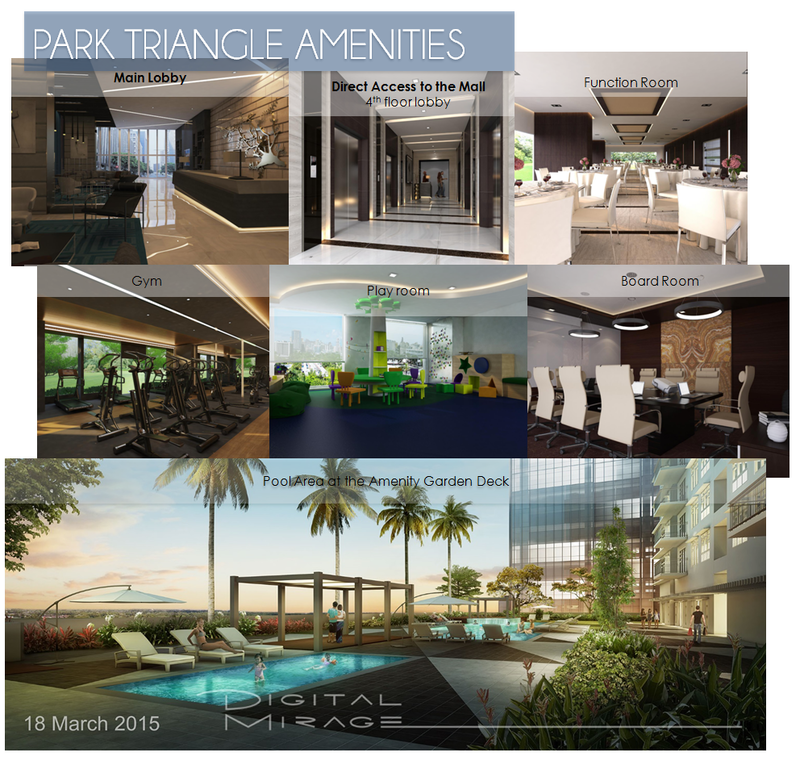 AMENITIES: include 1.7 hectare amenity podium, inspired by a world famous resort hotel. It is composed of lounge and main lobby, function rooms, gym and fitness center, mini theater, children’s playground, jogging path, landscaped gardens, and swimming pools – 3 lap pools, 3 wade pools and kiddie pools. LOCATION: Jupiter St., Nicanor Garcia, Makati City. I . Park Triangle Corporate Center – consists of 30 physical floors [24 of which are office floors] with 5 basement levels. II. Park Triangle Ayala Mall – An Ayala Mall that will be launched 2nd quarter of 2018. It has 5 floors of retail and dining plus fresh supermarket selection. III. Kidzania Manila – 4th quarter of this year is when Kidzania Manila at Park Triangle will be fully operational. It is an “edutainment” or educational entertainment center designed as a real city to provide the ultimate role playing opportunity for kids. IV. 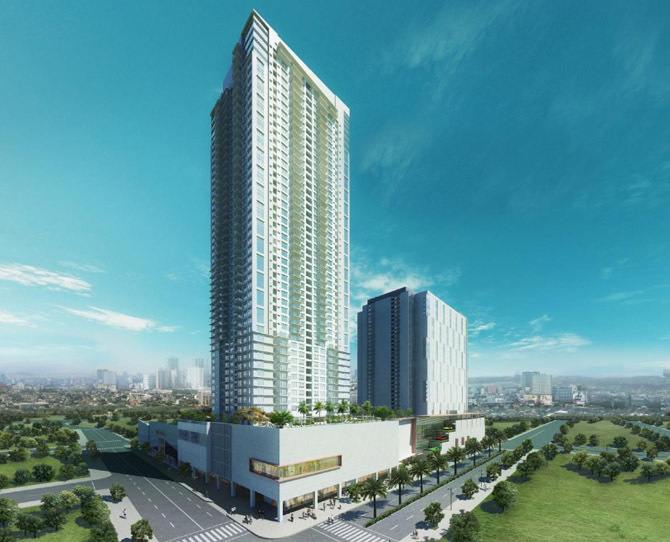 Park Triangle Residences – It is a 49-storey with 616 residential units, situated along 32nd, where the corporate office row in BGC are, and 11th avenue, where vibrant lifestyle strip in BGC is located. 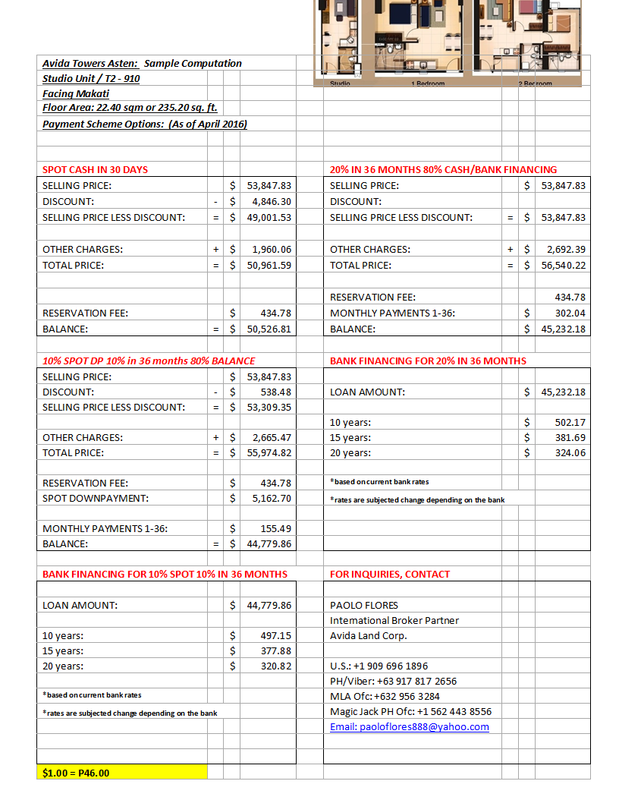 PRICE: See sample computation here. 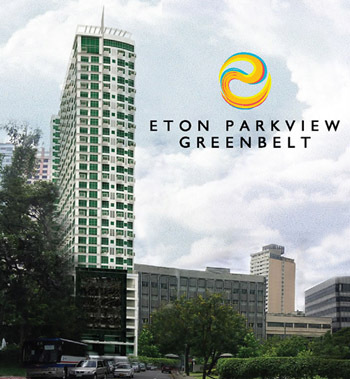 Eton Parkview Greenbelt is a premium, 33 storeys, ALL LOFT residential masterpiece at the center of a prestigious Makati neighborhood – Legaspi Village. AMENITIES: It has world-class amenities such as Swimming Pool, Fitness Center, Function Room, Children’s Playground, Lobby and Lounge Area. Bonifacio Global City or BGC is one of the progressive cities in the Metro. With its state-of-the-art infrastructures and grandiose communities, it’s no wonder developers like Alveo, chose the said city to build their next community – Park Triangle. 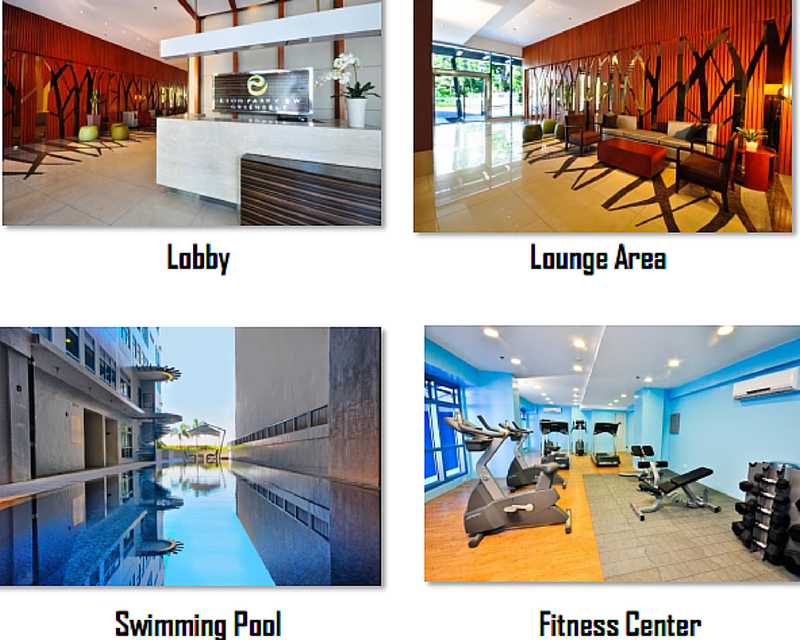 Main Lobby, Function Room, Gym, Play Room, Board Room and Pool Area at the Amenity Garden Deck. It will also have an exclusive access (located on the 4th floor lobby) to an Ayala Mall – Park Triangle Ayala Mall. This is a premium, 33 storeys, ALL LOFT residential masterpiece at the center of a prestigious Makati neighborhood – Legaspi Village. BUILDING COMPOSITION: Located at the basement are the Parking and Building Administration Office. On the Ground floor is where the Main Lobby and Commercial Shops can be found. 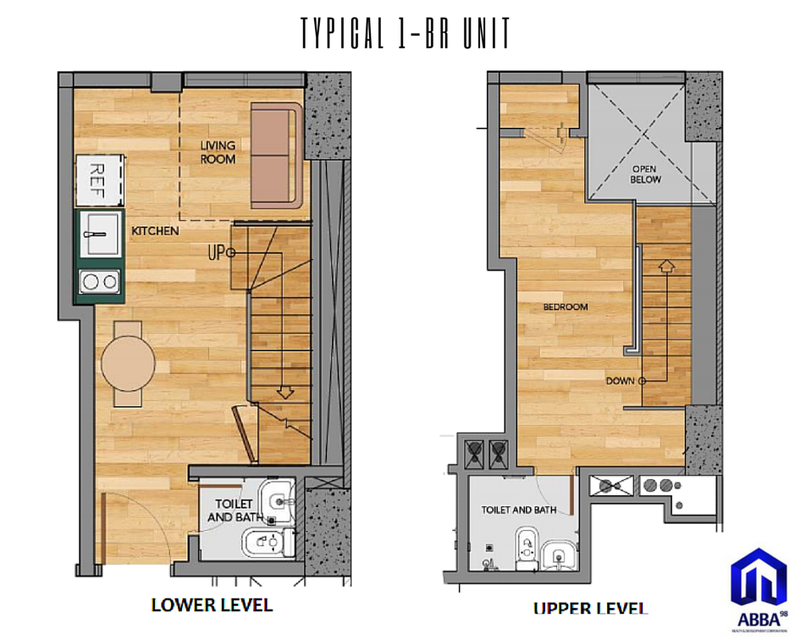 2nd to 7th floor are parking deck and 8th floor is the amenity floor with Condominium Loft Units while 10th to 33rd floor occupies the Residential Condominium Loft Units. BUILDING FEATURES: 2 Elevators, Airconditioned Main Lobby, Admin Office, Mail Room, CCTV, Fully-Automated Fire and Smoke Detection System, Water Reservoir & Separate Fire Reserves, Standby Emergency Power and Centralized Garbage Room. It has world-class amenities such as Swimming Pool, Fitness Center, Function Room, Children’s Playground, Lobby and Lounge Area. 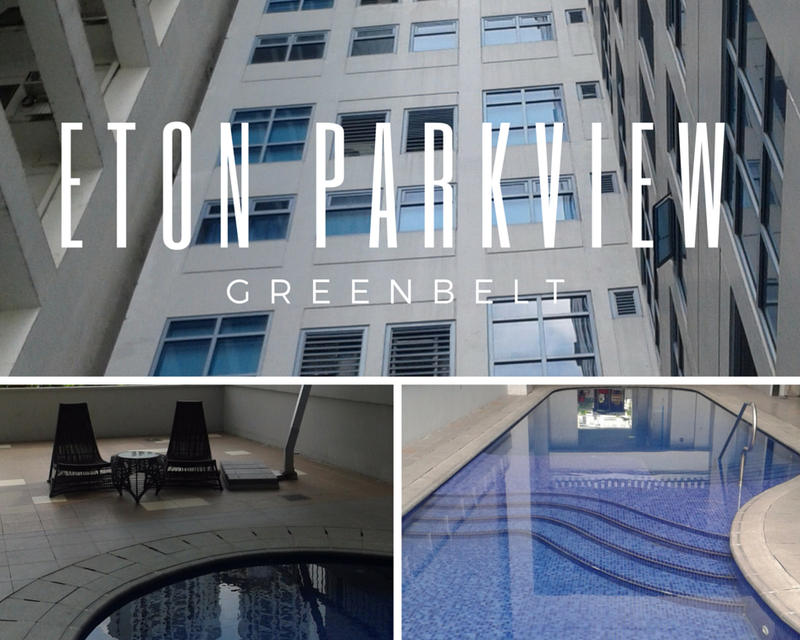 Acquire a piece of this property and everything that you need (near the school, hospital, mall, metro railway train, EDSA, Makati Business District) will be within reach! What an awesome way to end this week! 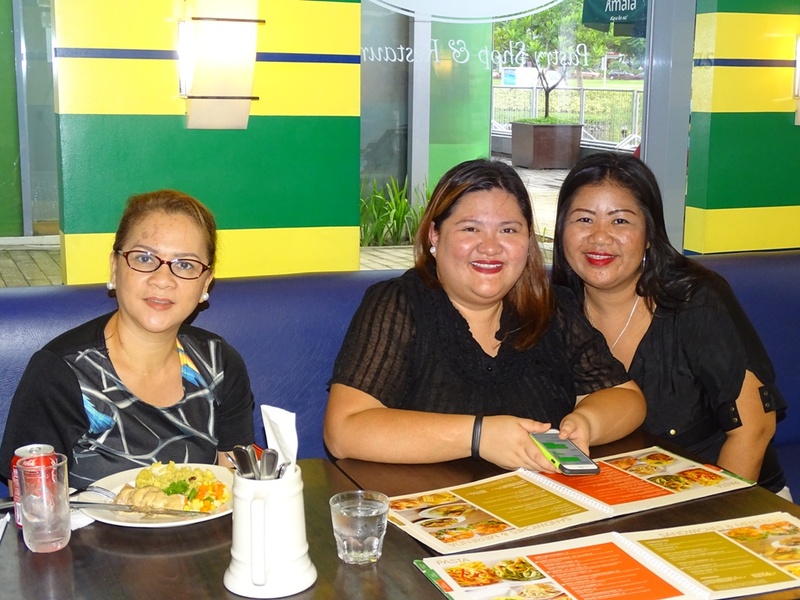 Today, we sat down with Ms. Kathy, broker manager of Amaia Steps Nuvali to give you more insights on the property. Moreover, we will also show you snippets of our visit to further whet your interest on this lovely place. ABBA: Why invest in a property? Ms. KATHY: there are many reasons but on top of the list would be Capital GrowtH. this simply means The value of your property will grow over time and may be extremely beneficial financially if well chosen. Not only will you benefit from steady capital growth, but regular monthly rental returns should you decide to have it rented in the future. second, property is always A safe investment. This is the only investment market which is not dominated by investors, hence creating a natural buffer in the market. It is also the most forgiving investment; if you purchase the worst house in the area, chances are that its value will still increase over time. In line with that, it is so easy to avail of. Anyone can invest; You do not have to possess a vast amount of knowledge, as you may with stocks or opening up a business. lastly, you have the full control. you can make all the decisions and have control over all of your returns. 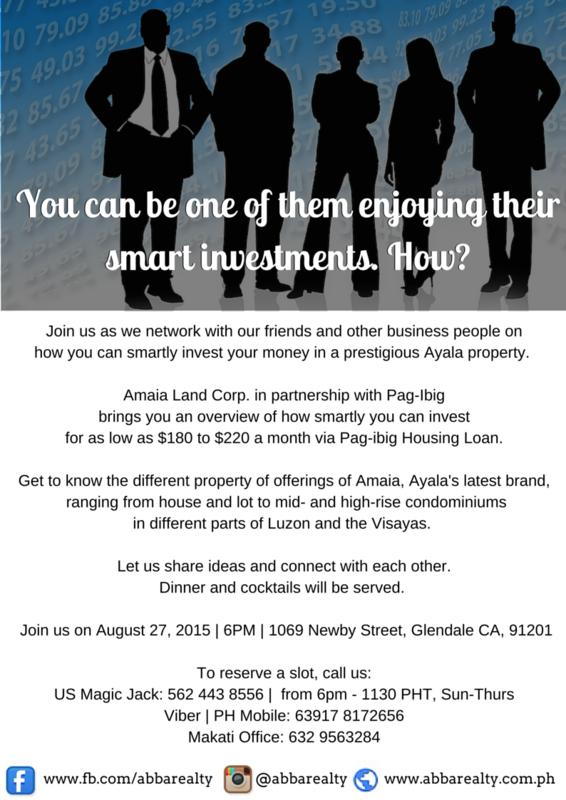 abba realty: Why choose Ayala Land? MS. KATHY: AYALA LAND has already established its mark in real estate development. 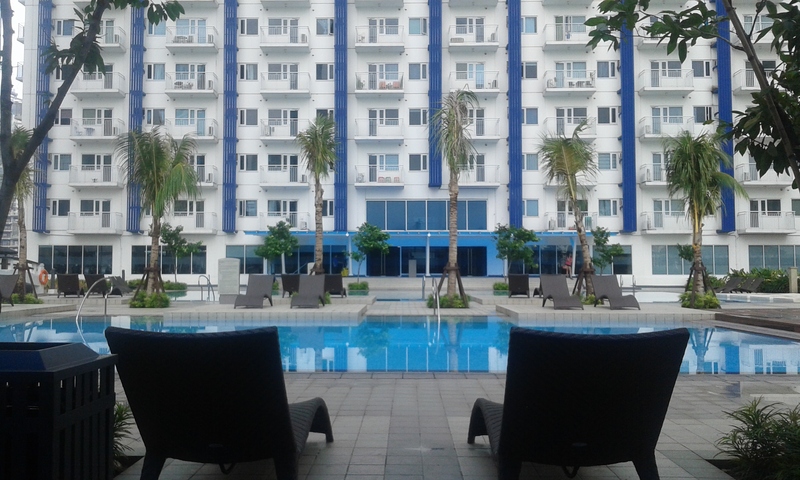 Ayala Land Properties are well planned, well constructed, and well maintained.Because of good location, high quality of construction, and long-term commitment to service and maintenance, our properties have enhanced the living experience of our residents. 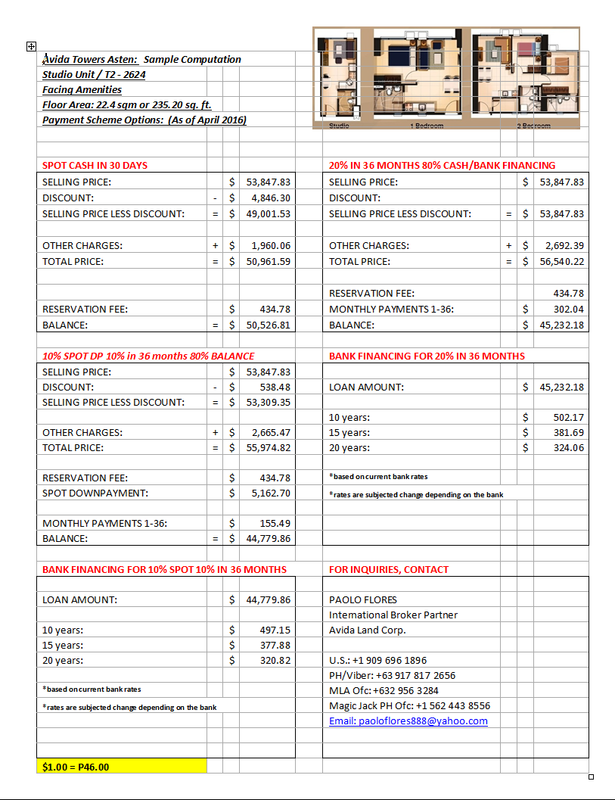 In addition, our properties have typically shown growth in value over time. 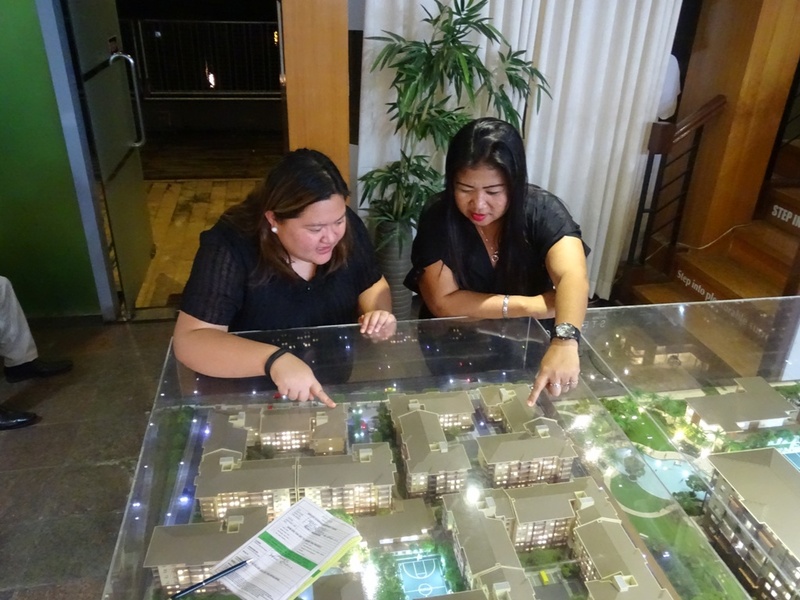 ABBA REALTY: What makes Amaia Steps Nuvali the perfect property? ms. kathy: First selling point of this project is Location. 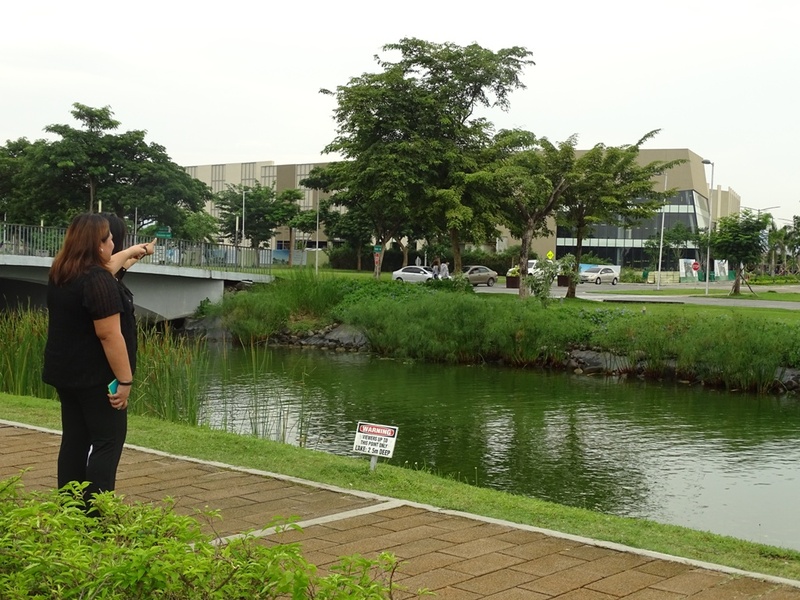 Nuvali is the largest scale eco-city development of Ayala Land (2,200 hectares). Rising at the central district of Nuvali, Amaia Steps Nuvali/parkway enjoys the privileges of standing in a fully master planned development. built to support and sustain itself today and in the future. with in a 500 meter radius are mixed used developments like neighbouring villages (other ayala brand), future retail areas and institutional establishment. on top of that, we have the full swing of amenities from the Swimming Pools (adult and kiddie), Basketball court, children’s playground, clubhouse, meditation patch, reading nooks and support retail. Abba: How much do you need to invest? ABBA: that is simply awesome. thanks, ms. kathy! MS. KATHY: you’re welcome! let’s go around the place! 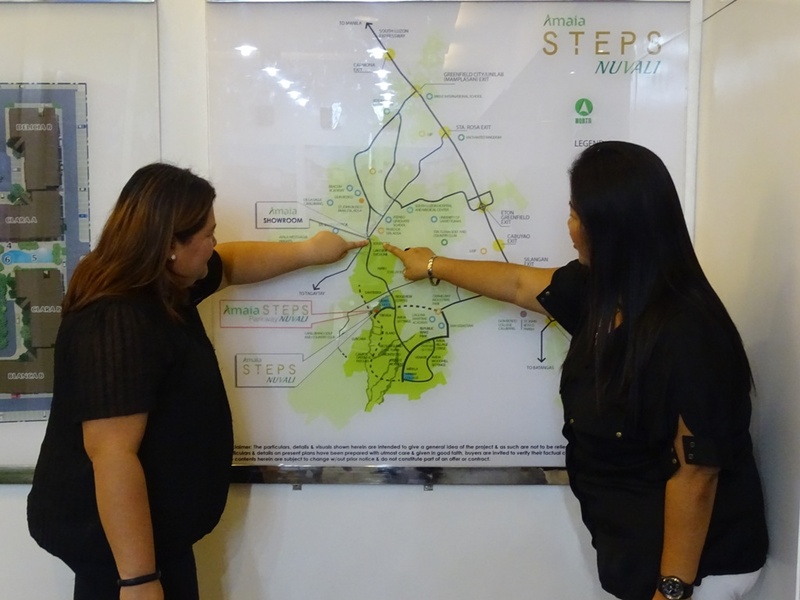 First, Ms. Kathy showed us the masterplan for Amaia Steps Nuvali and we were really awed about the progressive planning for this place. 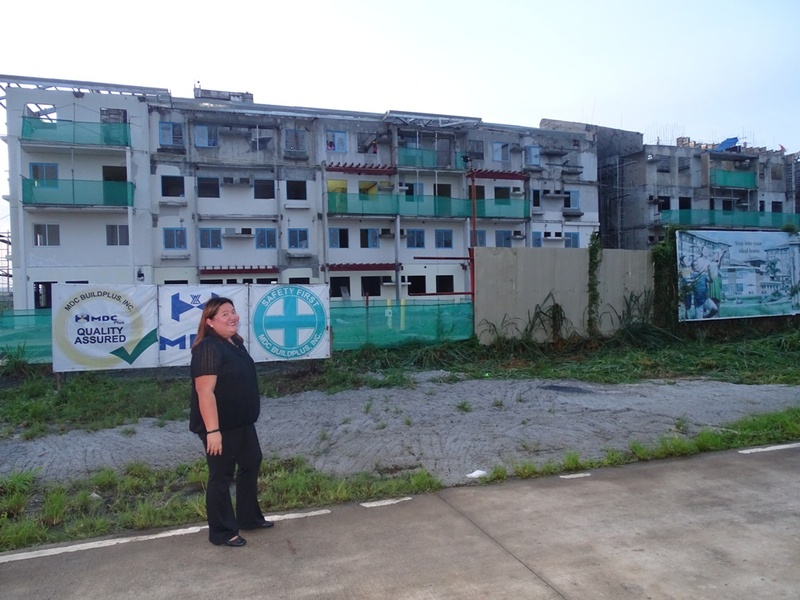 We also visited the development site and the plan slowly unfolds in front of you. We couldn’t help but get excited on how this place would look like several years from now! We then checked out the trails and other features and amenities around the area. Truth is, these facilities are one of the reasons why this property is enticing. 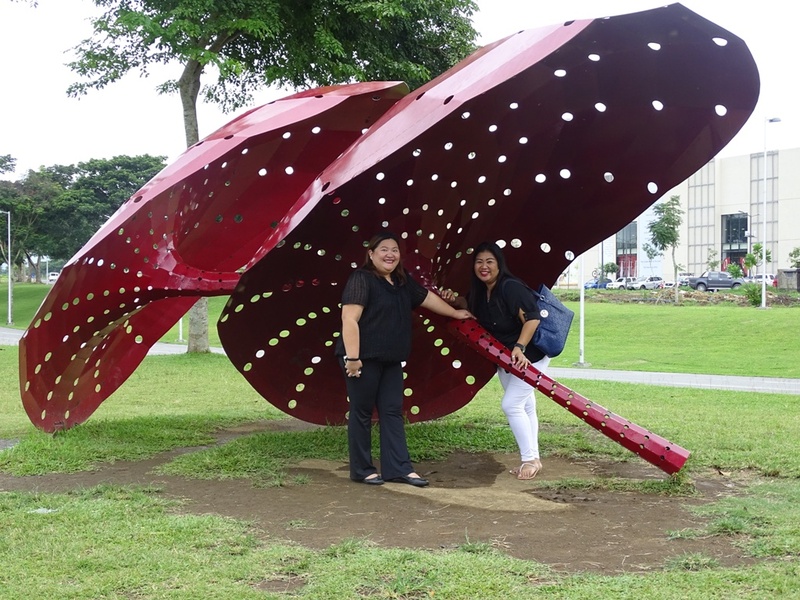 Amaia Steps Nuvali exudes the sophistication of an urban lifestyle and at the same time, it is still covered in lush greeneries and other outdoor activities that make living in Amaia Steps Nuvali convenient yet fun! It’s like having a vacation every single day!